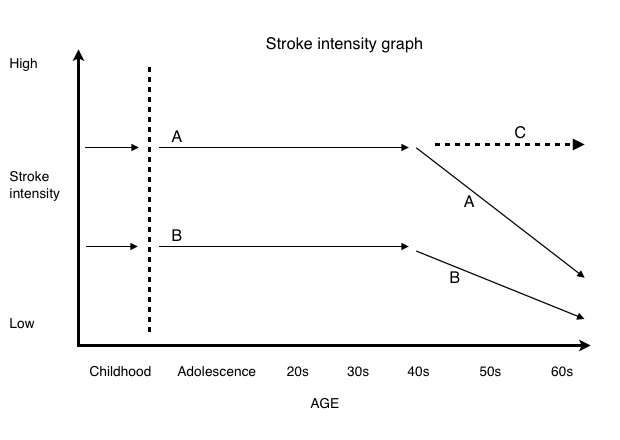 The stroke intensity graph shows that the pattern is set in childhood. Line A shows the person who was raised in household where there was a high intensity of strokes, usually which are mostly negative. This person then becomes, one could say “addicted”, to that stroke intensity and this is very difficult to deal with, as it is a true addiction. Then through adolescence, early adulthood and mid adulthood the person will structure their lives so that the same level of stroke intensity is maintained. They can do this by playing games or taking on activities that create a high level of stress. The person on line B will have much less of a drive to create high stroke intensity throughout their lives. An example on line A is the man who takes on risky business dealings, will complain about the stress but he will continue to do it. The person who gets involved in relationship dramas, by playing relationship games and continues to do so over time even though they know what is going on. In general the person who complains about being stressed and wants to not be so stressed but then will set about doing things such that the high stroke intensity is maintained. This will usually continue until the beginning late adulthood (40s to 50s) and then it often reduces as one simply cannot keep living with that level of stroke intensity in their life. This is very difficult to deal with and is also often the case for the problem drinker or drug user. When they stop doing things that create a high stroke intensity they get bored quite quickly. They can find this very difficult to tolerate for any length of time. A person at this point is often misdiagnosed as depressed when they are really either just bored or just stroke deprived. When the stroke level is recreated the ‘depression’ stops. If this happens to a client then it probably means they have been misdiagnosed as depressed. Really the only solution is to change from negative strokes to positive strokes but negative strokes always have more potency than positive strokes. With the dependent drug user the therapeutic goal is to work with them until they ‘grow out of it’. Helping them stay alive and as safe as possible until the need for that level of strokes reduces with age. This therapeutic process is described in my book – Working with drug and alcohol users. What you can do to assist the individual reaching the ‘I have had enough of living like this” point as early as possible. Some people progress along line C. The longer this continues the more it becomes an issue of suicidality. The person is living a life style where either the stress will kill them or eventually they are killed by engaging in some kind of high risk activity.